What can you do when a traffic detour cuts down on visitors to town? Next year, Kristina Vonberge’s town is going to face bridge construction and a major traffic detour. She asked for ideas during the discussion session of our SaveYour.Town webinar on the arts. People coming to town are going to have to detour 17 miles out of the way to get to town. How can she draw people to visit even when it’s a big pain in the neck? She has been using public art as a way of bringing people to town, but she knows that may not be enough when it’s so hard to get to town. If the art is going to be there for years, there’s no reason for people to visit right now. What she needs is temporary things that people have to come to town now for. Together, Deb and I and the attendees all riffed on the ideas of special events, temporary installations and short term exhibits. Here’s the best idea we came up with. Turn the detour itself into the attraction. Put art all along the detour route. Make it temporary art. 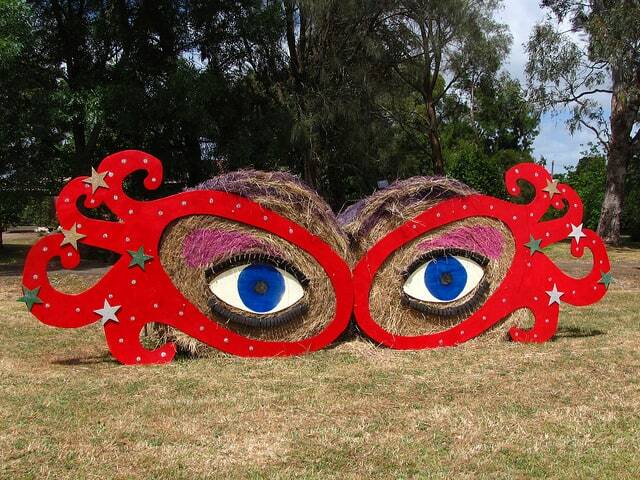 Use hay bale art that will only last for a season or two. Do painted art that will intentionally flake off over time. Use fabric or other materials that will deliberately decay. Suddenly people have a reason to make the drive to town right now. The detour becomes an enjoyable sight for residents and an attraction to visitors. It’s your own temporary Enchanted Highway. It’s a flash outdoor art gallery. It’s an event, a happening, a reason to come to town now, even though it’s a long way around. The recorded flipped webinar on the arts in rural places is available to SaveYour.Town Megaphone Members, if you want to see how it worked. Sometimes we think everything has to be made to last forever. But the arts give us a chance to explore things that are only meant to be here for a bit. We can be more tolerant of something that isn’t to our taste or maybe even pushes people’s boundaries if we know it’s temporary. We could let people cut loose a little, be a little more daring. What could your town create if you freed yourself from the burden of permanence?